Split them in half, cover with cream gravy and serve with Chicken Fried Steak. Butter them well and top with ruby red strawberry preserves for a treat that will rival most any dessert. Bake them, covered, on top of your favorite stew next time you make a pot. Late one Halloween after the candy had run out, I once observed my father retrieve two cold biscuits from the back of the stove and drop them into the treat bags of a pair of neighborhood goblins, however, that is neither a popular nor recommended use, even in Texas. Biscuits are one of the so-called quick breads -- breads that distinguish themselves by rising during, not before, the baking process. It's an apt name, because an experienced biscuit maker can have hot biscuits on the table in a few minutes. Get the dough made with as little stirring and handling as possible. That will assure a light and flaky result. Use a nice sharp biscuit cutter with holes in the top to let air escape (so you won't flatten the biscuit as you cut it). Yes, if you use lard instead of shortening, or even half lard and half shortening, you can make a better biscuit, but lard is hard to find in some areas, and most people decide they can do as well with shortening. No question about it, though, the use of lard results in excellent baked goods of all kinds. Make sure each of your ingredients, especially your baking powder, is fresh. This next thing is hard to do (and I don't think Grandma observed this rule), but once you have cut out your biscuits, don't reroll the little leftover, in-between pieces of dough. They will make a tough biscuit. In Grandma's waste-not-want-not world, you didn't throw away food. Maybe she gave that leftover dough to the cat, because I don't recall even one of her biscuits being tough or heavy. 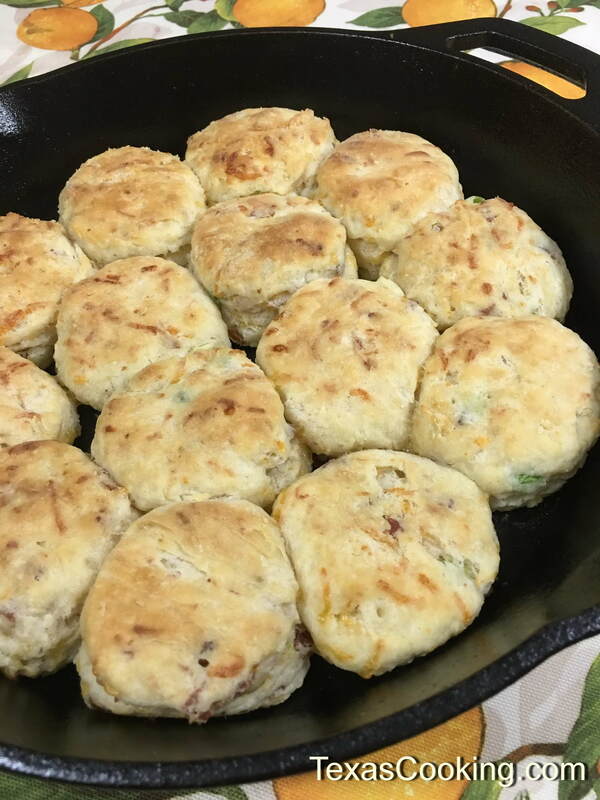 The fact is that biscuits with their simple ingredients and speedy preparation do, as cornbread does, have a place on the twenty-first century kitchen table. The biscuits that erupt from those little cylinders found "in your grocer's dairy case" bear little resemblance to the biscuits that will result from the recipes below. So here's how Grandma made her biscuits. Sift the dry ingredients into a bowl. Cut in the shortening with a pastry blender, and add the buttermilk, blending quickly, just until dry ingredients are moistened. A sticky dough will result. Bake at 450°F for 12 to 15 minutes. Makes about 12 biscuits. Grandma did one thing that I've never seen spelled out in any recipe: The first thing she did when she made biscuits was melt a rounded teaspoon or so of shortening in her skillet (she always used a skillet). Then, she let the skillet cool while she mixed up the dough. As she cut each biscuit, she would place it in the skillet, then turn it over, all in two quick wrist motions. That way, each biscuit got a thin coating of melted shortening on the top. Because she did it that way, I do it that way when I use a skillet. Now Grandma made buttermilk biscuits, but there are lots of other kinds. (Biscuits, you know, are a very close relation of the scone.) Listed below are links to Baking Powder Biscuits, which are made with sweet milk, and a really fun biscuit to make, Bacon, Onion and Cheese Biscuits. And if you think you are in too big a hurry to cut your biscuits out, you can make Cornmeal Drop Biscuits. As a person who loves cooking, I really like to encourage other people to cook. And I don't mean the open-2-cans-and-combine-with-package-mix kind of cooking. Hot, made-from-scratch biscuits can really make a meal, even if it's a quick dinner that does include a few opened cans. And the more often you make them, the faster you get, and the better the biscuits get.